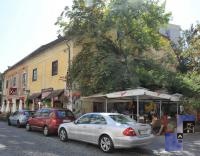 This attractive, spacious apartment is located in historical centre on Rimska cesta, behind the Faculty of Arts, Faculty of Mechanical Engineering, Drama theater and in vicinity to congress center Cankarjev dom, just a step away from tourist attractions, only 800 m away from main square. It is in the 1st floor of the low traditional building. Apartment is modern equipped. It has bedroom with two twin beds. In the spacious living area there is a kitchen with large refrigerator, glass-ceramic oven, stove, dinning corner, comfortable sofa, writing desk and LCD TV. Above the kitchen part there is a low gallery with additional mattress bed (140 x 200 cm). 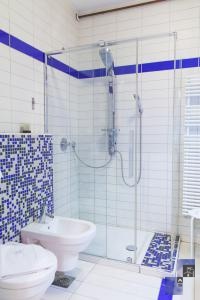 The bathroom is equipped with massage shower and Miele washing machine. The apartment is fully equipped with cooking utensils, cutlery, towels, linen, iron, ironing board, hair dryer, telephone, CATV, free broadband wired and wireless (Wi-Fi) internet access.